Management of multidrug-resistant Acinetobacter spp. infections is a great challenge for physicians and clinical microbiologists. Its ability to survive in a hospital milieu and its ability to persist for extended periods of time on surfaces makes it a frequent cause for healthcare-associated infections and it has led to multiple outbreaks. , It causes a wide spectrum of infections that include pneumonia, bacteremia, meningitis, urinary tract infection, and wound infection. In the current review 'MDR Acinetobacter spp.' shall be defined as the isolate resistant to at least three classes of antimicrobial agents - all penicillins and cephalosporins (including inhibitor combinations), fluroquinolones, and aminoglycosides. 'XDR Acinetobacter spp.' shall be the Acinetobacter spp. isolate that is resistant to the three classes of antimicrobials described above (MDR) and shall also be resistant to carbapenems. Finally, 'PDR Acinetobacter spp.' shall be the XDR Acinetobacter spp. that is resistant to polymyxins and tigecycline [Figure 1]. The above definitions have been described keeping in view the different mechanisms of resistance known till date and the antimicrobials being used to treat various Acinetobacter spp. infections. 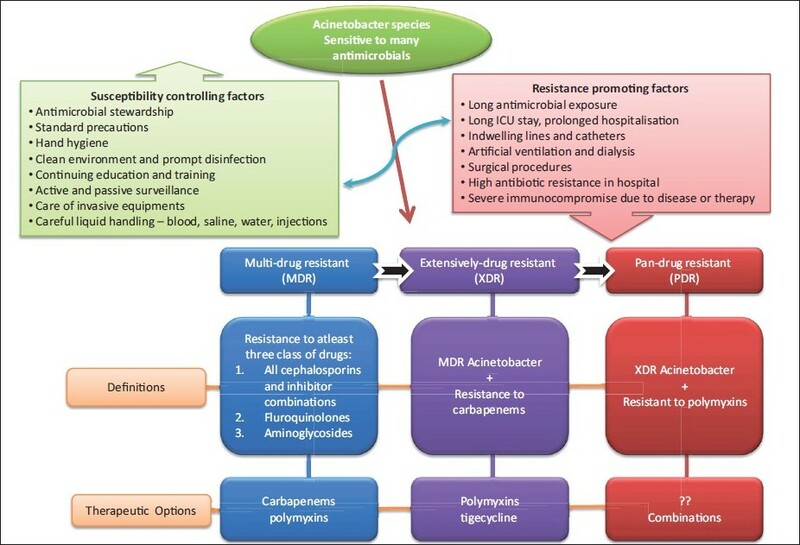 These definitions further help to clearly define the extent of resistance and rational antimicrobial therapy . Various risk factors for colonization or infection with multidrug-resistant Acinetobacter species are summarized in [Table 2]. Many case control studies have revealed that prior exposure to antimicrobial therapy has been the most common risk factor identified in multivariate analysis. Carbapenems and third-generation cephalosporins are the most commonly implicated antibiotics, followed by fluoroquinolones, aminoglycosides, and metronidazole. The second most common risk factor identified in case-control studies is mechanical ventilation. Other risk factors include a stay in an ICU, length of ICU and hospital stay, severity of the illness, recent surgery, and invasive procedures. ,,,, Furthermore, studies on A. baumannii outbreaks have revealed environmental contamination as an important risk factor in the causation of outbreaks. During the early 1970s the clinical isolates of Acinetobacter spp. were usually susceptible to gentamicin, minocycline, nalidixic acid, ampicillin, or carbenicillin, singly or in a combination therapy. However, since 1975, increasing resistance started appearing in almost all groups of drugs including the first and second generation cephalosporins. Initially they retained at least partial susceptibility against the third and fourth generation cephalosporins, fluoroquinolones, semi synthetic aminoglycosides, and carbapenems, with almost 100% isolates retaining susceptibility to imipenem. However, during late 1980s and 1990s, worldwide emergence and spread of Acinetobacter strains resistant to imipenem further limited the therapeutic alternatives. ,,,,, By the late 1990s, carbapenems were the only useful agents remaining that could combat many severe Acinetobacter infections. Furthermore, due to the emergence of carbapenem resistance in the strains of A. baumannii, largely through a clonal spread, the therapeutic options are decreasing. ,, Multiple mechanisms have been found to be responsible for the resistance to carbapenems in A. baumannii. The mechanisms of antimicrobial resistance in A. baumannii generally falls into three broad categories: (1) antimicrobial-inactivating enzymes, (2) reduced access to bacterial targets (due to decreased outer membrane permeability caused by the loss or reduced expression of porins, overexpression of multidrug efflux pumps) and (3) mutations that change targets or cellular functions (alterations in penicillin-binding proteins; PBPs). , A combination of several mechanisms may be present in the same microorganism, as has also been observed in other gram-negative bacteria. Different mechanisms of resistance in the Acinetobacter species are summarized in [Table 3]. VEB-1 ESBL has also been identified in A.baumannii . The bla VEB-1 was identified as a form of gene cassette in class 1 integrons yet encoded on the chromosome. This integron was identical to that identified in Pseudomonas aeruginosa Thailand and was also associated with an upstream IS element (IS26), indicating the possible origin and mechanism of spread to A. baumannii. , VEB-1, has disseminated throughout hospitals in France (clonal dissemination) and has also been reported from Belgium and Argentina (VEB-1a). Data of the antibiotic susceptibilities of Acinetobacter from different geographical regions revealed that the resistance of Acinetobacter spp. to imipenem was in the range of no resistance to 40% (2000 - 2004). In a report from a Teaching Hospital in Spain (2002), the prevalence of imipenem-resistant Acinetobacter spp. had increased from no resistance in 1991 to 50% in 2001. Among Acinetobacter spp. derived from 30 European centers from the worldwide collection of SENTRY from 2001 to 2004, the proportion of strains resistant to imipenem, meropenem, ampicillin/sulbactam, and polymyxin B was: 26.3, 29.6, 51.6, and 2.7%, respectively. , Gladstone et al. from Vellore, India (2005), reported a prevalence of 14% carbapenem-resistant Acinetobacter spp., isolated from tracheal aspirates (n = 56). In Delhi, India (2006), the prevalence of carbapenem resistance in Acinetobacter spp. isolated from different clinical samples was found to be almost 35%. In Greece, the proportion of imipenem-resistant A. baumannii isolates from patients hospitalized between 1996 and 2007, in tertiary care hospitals, in several regions of the country rose from no resistance to 85% (ICUs), 60% (medical wards), and 59% (surgical wards) [Greek System for Surveillance of Antimicrobial Resistance (GSSAR): http://www.mednet.gr/whonet/ ]. Bloodstream isolates from the same dataset exhibited even higher resistance rates [http://www.mednet.gr/whonet/]. The prevalence of imipenem resistance in Acinetobacter baumannii isolated from a burns unit of USA was found to be as high as 87% (2007). The above-mentioned data suggests that an antibiotic therapy should always be guided by in vitro susceptibility profile of the organism. Although there are cases of community acquired infections caused by Acinetobacter spp., the primary pathogenic role of these bacteria is undoubtedly as a nosocomial pathogen. ,,,,,,, Healthcare-associated pneumonia, particularly ventilator-associated pneumonia in patients confined to hospital ICUs is the most common infection caused by this organism. However, infections including bacteremia, urinary tract infection, secondary meningitis, skin and soft tissue infections, and bone infections have also been increasingly reported. Such infections are often extremely difficult to treat because of wide spread resistance of this organism to a major group of antibiotics ,, The therapeutic difficulties are coupled with the fact that these bacteria have a significant capacity for long-term survival in the hospital environment, with corresponding enhanced opportunities for transmission between patients, either via human reservoirs or via inanimate materials ,, . Historically, carbapenems have resulted in the best therapeutic response for infections caused by MDR A baumannii. For carbapenem-resistant A baumannii (XDR Acinetobacter spp. ), tigecycline and colistimethate are two of the most frequently used alternative agents [Figure 1]. The global spread of XDR Acinetobacter spp. is a major challenge for the healthcare industry and other drugs such as colistin and polymyxin B, and newer drugs such as tigecycline and doripenem, have been tried for treating such infections. With the emergence of PDR Acinetobacter spp. and the paucity of newer antimicrobial compounds, combination therapies like imipenem + ampicillin-sulbactam, rifampin + colistin, and so on, have been tried worldwide. Such regimens are not only more expensive, but the side effects and toxicity are more and the efficacy less. ,, Increasing antimicrobial resistance leaves few therapeutic options and there are no well-designed clinical trials to compare treatment regimens for MDR, XDR, and PDR Acinetobacter spp. infections. Aminoglycoside agents, such as tobramycin and amikacin, are therapeutic options for infection with drug-resistant Acinetobacter isolates that retain susceptibility. These agents are usually used in conjunction with another active antimicrobial agent. Many resistant Acinetobacter isolates retain intermediate susceptibility to amikacin or tobramycin. Combination therapy with tigecycline and other antimicrobial agents has been studied. Considering all antimicrobials in combination with tigecycline, a chequerboard analysis showed 5.9% synergy, 85.7% indifference, and 8.3% antagonism. Tigecycline showed synergism with levofloxacin, amikacin, imipenem, and colistin. Antagonism was observed for the tigecycline / piperacillin-tazobactam combination. Synergism was detected only among tigecycline non-susceptible strains. Time-kill assays confirmed the synergistic interaction between tigecycline and levofloxacin, amikacin, imipenem, and colistin. No antagonism was confirmed by time-kill assays. Most results of the combination therapy are comparable to the cure rates reported for parenteral colistin alone and the wide variety of other agents used limits the ability to draw any conclusions with regard to combination therapy. Controlled clinical studies are needed to determine whether any antimicrobial combinations translate into useful therapeutic strategies. There is paucity of literature that recommends or demonstrates the use of polymyxins for treatment of children infected with XDR and PDR Acinetobacter spp. A case series of critically ill children who received intravenous colistimethate for treatment of infections due to XDR gram-negative bacteria has been published. The dosage of colistin administered in the case series was colistimethate at a total daily dosage of 5 mg/kg [62.500 international units (IU)/kg], administered in equally divided doses every 8 hours. Five out of the seven reported patients received a ten-day colistimethate treatment and the remaining two received treatment for two and 23 days, respectively. All these infections improved with intravenous colistimethate therapy. No adverse events occurred in this case series. In another retrospective study, a case series of children with burns, focused on the efficacy and safety of colistimethate treatment also revealed similar results. In both case series neither nephrotoxicity nor neurotoxicity was reported in any of the cases. Inadequate hand hygiene remains a significant factor in the transmission of this pathogen. Cross-transmission of MDR A. baumannii occurs via direct contact from hands and gloves from healthcare professionals to patients. Rational use of antimicrobials is another important aspect to delay the emergence of XDR and PDR Acinetobacter spp. This can be achieved using an effective antimicrobial stewardship program having at least three components, namely, placing antibiotic policy, education regarding the stewardship program, and monitoring of the program [Figure 1]. Various infection control measures that can be adopted during routine care and during outbreak situations are summarized in [Table 4]. Involvement at all levels of healthcare personnel, including top management personnel, is imperative for effective implementation and success of the program. Acinetobacter spp. are rapidly spreading with emergence of extended resistance to even newer antimicrobials. They have the ability to acquire resistance at a much faster pace than other gram-negative organisms. Due to their ease of survival in the hospital environment, they have immense potential to cause nosocomial outbreaks. In addition to antibiotic resistance, their biofilm forming ability plays a crucial role in their in-vitro and in-vivo survival. Thus, to decrease the spread of Acinetobacter infections and reduce the pace of emergence of resistance in MDR Acinetobacter, it is important to promote the rational use of antimicrobials, with implementation and monitoring of the Antibiotics Stewardship Program in hospitals. Hand hygiene and barrier nursing are important to keep the spread of infection in check. 1. Fournier PE, Richet H. The epidemiology and control of Acinetobacter baumannii in health care facilities. Clin Infect Dis 2006;42:692-9. 2. Jawad A, Heritage J, Snelling AM, Gascoyne-Binzi DM, Hawkey PM. Influence of relative humidity and suspending menstrua on survival of Acinetobacter spp. on dry surfaces. J Clin Microbiol 1996;34:2881-7. 3. Beijerinck M. Pigmenten als oxydatieproducten gevormd door bacterien. Vers Konin Akad Wet Ams 1911;19:1092-1103. 4. Bouvet PJ, Grimont PA. Taxonomy of the genus Acinetobacter with the recognition of Acinetobacter baumannii sp. nov., Acinetobacter haemolyticus sp. nov., Acinetobacter johnsonii sp. nov. and Acinetobacter junii sp. nov. and emended description of Acinetobacter calcoaceticus and Acinetobacter lwoffii. Int J Syst Bacteriol 1986;36:228-40. 5. Gerner-Smidt P. Ribotyping of the Acinetobacter calcoaceticus-Acinetobacter baumannii complex. J Clin Microbiol 1992;30:2680-5. 6. Gerner-Smidt P, Tjernberg I, Ursing J. Reliability of phenotypic tests for identification of Acinetobacter species. J Clin Microbiol 1991;29:277-82. 7. Bergogne-Bιrιzin E, Towner KJ. Acinetobacter spp. as nosocomial pathogens: microbiological, clinical, and epidemiological features. Clin Microbiol Rev 1996;9:148-165. 8. Lessel EF. Minutes of the Subcommittee on the Taxonomy of Moraxella and Allied Bacteria. Int J Syst Bacteriol 1971;21:213-4. 9. Bouvet PJ, Jeanjean S. Delineation of new proteolytic genomic species in the genus Acinetobacter. Res Microbiol 1989;140:291-9. 10. Tjernberg I, Ursing J. Clinical strains of Acinetobacter classified by DNA-DNA hybridization. APMIS 1989;97:596-605. 11. Falagas ME, Koletsi PK, Bliziotis IA. The diversity of definitions of multidrug-resistant (MDR) and pandrug-resistant (PDR) Acinetobacter baumannii and Pseudomonas aeruginosa. J Med Microbiol 2006;55:1619-29. 12. Falagas ME, Karageorgopoulos DE. Pandrug resistance (PDR), extensive drug resistance (XDR), and multidrug resistance (MDR) among Gram-negative bacilli: need for international harmonization in terminology. Clin Infect Dis 2008;46:1121-2. 13. Simor AE, Lee M, Vearncombe M, Jones-Paul L, Barry C, Gomez M, et al. An outbreak due to multiresistant Acinetobacter baumannii in a burn unit: risk factors for acquisition and management. Infect Control Hosp Epidemiol 2002;23:261-7. 14. Gusten WM, Hansen EA, Cunha BA. Acinetobacter baumannii pseudomeningitis. Heart Lung 2002;31:76-8. 15. Peleg AY, Seifert H, Paterson DL. Acinetobacter baumannii: emergence of a successful pathogen. Clin Microbiol Rev 2008;21:538-82. 16. La Scola B, Raoult D. Acinetobacter baumannii in human body louse. Acinetobacter baumannii in human body louse. 2004;10:1671-3. 17. Seifert H, Dijkshoorn L, Gerner-Smidt P, Pelzer N, Tjernberg I, Vaneechoutte M. Distribution of Acinetobacter species on human skin: comparison of phenotypic and genotypic identification methods. J Clin Microbiol 1997;35:2819-25. 18. Berlau J, Aucken H, Malnick H, Pitt T. Distribution of Acinetobacter species on skin of healthy humans. Eur J Clin Microbiol Infect Dis 1999;18:179-183. 19. Dijkshoorn L, van Aken E, Shunburne L, van der Reijden TJ, Bernards AT, Nemec A, et al. Prevalence of Acinetobacter baumannii and other Acinetobacter spp. in faecal samples from non-hospitalised individuals. Clin Microbiol Infect 2005;11:329-32. 20. Somerville DA, Noble WC. A note on the gram negative bacilli of human skin. Rev Eur Etud Clin Biol 1970;40:669-70. 21. Taplin D, Zaias N. The human skin as a source of mima-herellea infections. JAMA 1963;186:952-4. 22. Cisneros JM, Rodrνguez-Baρo J. Nosocomial bacteremia due to Acinetobacter baumannii: epidemiology, clinical features and treatment. Clin Microbiol Infect 2002;11:687-93. 23. Hartzell JD, Kim AS, Kortepeter MG, Moran KA. Acinetobacter pneumonia: a review. MedGenMed 2007;9:4. 24. Allen KD, Green HT. Hospital outbreak of multi-resistant Acinetobacter anitratus: an airborne mode of spread? J Hosp Infect 1987;9:110-9. 25. Buxton AE, Anderson RL, Werdegar D, Atlas E. Nosocomial respiratory tract infection and colonization with Acinetobacter calcoaceticus. Epidemiologic characteristics. Am J Med 1978;65:507-13. 26. Montefour K, Frieden J, Hurst S, Helmich C, Headley D, Martin M, Acinetobacter baumannii: an emerging multidrug-resistant pathogen in critical care. Crit Care Nurse 2008;28:15-25. 27. Falagas ME, Karveli EA. The changing global epidemiology of Acinetobacter baumannii infections: a development with major public health implications. Clin Microbiol Infect 2007;13:117-9. 28. Bernards AT, Harinck HI, Dijkshoorn L, van der Reijden TJ, van den Broek PJ. Persistent Acinetobacter baumannii? Look inside your medical equipment. Infect Control Hosp Epidemiol 2004;25:1002-4. 29. Das I, Lambert P, Hill D, Noy M, Bion J, Elliott T. Carbapenem-resistant Acinetobacter and role of curtains in an outbreak in intensive care units. J Hosp Infect 2002;50:110-4. 30. Podnos YD, Cinat ME, Wilson SE, Cooke J, Gornick W, Thrupp LD. Eradication of multidrug resistant Acinetobacter from an intensive care unit. Surg Infect (Larchmt)) 2001;2:297-301. 31. Rello J, Diaz E. Acinetobacter baumannii: a threat for the ICU? Intensive Care Med 2003;29:350-1. 32. Jawad A, Seifert H, Snelling AM, Heritage J, Hawkey PM. Survival of Acinetobacter baumannii on dry surfaces: comparison of outbreak and sporadic isolates. J Clin Microbiol 1998;36:1938-41. 33. Maragakis LL, Perl TM. Acinetobacter baumannii: epidemiology, antimicrobial resistance, and treatment options. Clin Infect Dis 2008;46:1254-63. 34. Playford EG, Craig JC, Iredell JR. Carbapenem-resistant Acinetobacter baumannii in intensive care unit patients: risk factors for acquisition, infection and their consequences. J Hosp Infect 2007;65:204-11. 35. Falagas ME, Kopterides P. Risk factors for the isolation of multidrug-resistant Acinetobacter baumannii and Pseudomonas aeruginosa: a systematic review of the literature. J Hosp Infect 2006;64:7-15. 36. Landman D, Quale JM, Mayorga D, Adedeji A, Vangala K, Ravishankar J, et al. Citywide clonal outbreak of multiresistant Acinetobacter baumannii and Pseudomonas aeruginosa in Brooklyn, NY: the preantibiotic era has returned. Arch Intern Med 2002;162:1515-20. 37. Cisneros JM, Rodrνguez-Baρo J, Fernαndez-Cuenca F, Ribera A, Vila J, Pascual A, Martνnez-Martνnez L, et al. Risk-factors for the acquisition of imipenem-resistant Acinetobacter baumannii in Spain: a nationwide study. Clin Microbiol Infect 2005;11:874-9. 38. Medina J, Formento C, Pontet J, Curbelo A, Bazet C, Gerez J, et al. Prospective study of risk factors for ventilator-associated pneumonia caused by Acinetobacter species. J Crit Care 2007;22:18-27. 39. Katsaragakis S, Markogiannakis H, Toutouzas KG, Drimousis P, Larentzakis A, Theodoraki EM, et al. Acinetobacter baumannii infections in a surgical intensive care unit: predictors of multidrug resistance. World J Surg 2008;32:1194-202. 40. Matthaiou DK, Michalopoulos A, Rafailidis PI, Karageorgopoulos DE, Papaioannou V, Ntani G, et al. Risk factors associated with the isolation of colistin-resistant gram-negative bacteria: a matched case-control study. Crit Care Med 2008;36:807-11. 41. Sunenshine RH, Wright MO, Maragakis LL, Harris AD, Song X, Hebden J, et al. Multidrug-resistant Acinetobacter infection mortality rate and length of hospitalization. Emerg Infect Dis 2007;13:97-103. 42. Marchaim D, Navon-Venezia S, Leavitt A, Chmelnitsky I, Schwaber MJ, Carmeli Y. Molecular and epidemiologic study of polyclonal outbreaks of multidrug-resistant Acinetobacter baumannii infection in an Israeli hospital. Infect Control Hosp Epidemiol 2007;28:945-50. 43. Oteo J, Garcνa-Estιbanez C, Miguelαρez S, Campos J, Martν S, Vila J, Domνnguez MA, et al. Genotypic diversity of imipenem resistant isolates of Acinetobacter baumannii in Spain. J Infect 2007;55:260-6. 44. Bano JR, Marti S, Soto S, Cuenca FF, Cisneros JM, Pachon J. Biofilm Formation In Acinetobacter Baumannii: Associated Features And Clinical Implications. Clin Microbiol Infect 2008;14:276-8. 45. Lee HW, Koh YM, Kim J, Lee JC, Lee YC, Seol SY, et al. Capacity of multidrug-resistant clinical isolates of Acinetobacter baumannii to form biofilm and adhere to epithelial cell surfaces. Clin Microbiol Infect 2008;14:49-54. 46. Canduela MJ, Gallego L, Sevillano E, Valderrey C, Calvo F, Pιrez J. Evolution of multidrug-resistant Acinetobacter baumannii isolates obtained from elderly patients with respiratory tract infections. J Antimicrob Chemother 2006;57:1220-2. 47. Zeana C, Larson E, Sahni J, Bayuga SJ, Wu F, Della-Latta P. The epidemiology of multidrug-resistant Acinetobacter baumannii: does the community represent a reservoir? Infect Control Hosp Epidemiol 2003;24:275-9. 48. Villers D, Espaze E, Coste-Burel M, Giauffret F, Ninin E, Nicolas F, et al. Nosocomial Acinetobacter baumannii infections: microbiological and clinical epidemiology. Ann Intern Med 1998;129:182-9. 49. Bergogne-Bιrιzin E. The increasing significance of outbreaks of Acinetobacter spp. : the need for control and new agents. J Hosp Infect 1995;30:441-52. 50. Go ES, Urban C, Burns J, Kreiswirth B, Eisner W, Mariano N, et al. Clinical and molecular epidemiology of Acinetobacter infections sensitive only to polymyxin B and sulbactam. Lancet 1994;344:1329-32. 51. Fernαndez-Cuenca F, Martνnez-Martνnez L, Conejo MC, Ayala JA, Perea EJ, Pascual A. Relationship between beta-lactamase production, outer membrane protein and penicillin-binding protein profiles on the activity of carbapenems against clinical isolates of Acinetobacter baumannii. J Antimicrob Chemother 2003;51:565-74. 52. Rice LB. Challenges in identifying new antimicrobial agents effective for treating infections with Acinetobacter baumannii and Pseudomonas aeruginosa. Clin Infect Dis 2006;43:100-5. 53. Hujer KM, Hamza NS, Hujer AM, Perez F, Helfand MS, Bethel CR, et al. Identification of a new allelic variant of the Acinetobacter baumannii cephalosporinase, ADC-7 beta-lactamase: defining a unique family of class C enzymes. Antimicrob Agents Chemother 2005;49:2941-8. 54. Perilli M, Felici A, Oratore A, Cornaglia G, Bonfiglio G, Rossolini GM, et al. Characterization of the chromosomal cephalosporinases produced by Acinetobacter lwoffii and Acinetobacter baumannii clinical isolates. Antimicrob Agents Chemother 1996;40:715-9. 55. Hujer KM, Hujer AM, Hulten EA, Bajaksouzian S, Adams JM, Donskey CJ, et al. Analysis of antibiotic resistance genes in multidrug-resistant Acinetobacter sp. isolates from military and civilian patients treated at the Walter Reed Army Medical Center. Antimicrob Agents Chemother 2006;50:4114-23. 56. Ruiz M, Marti S, Fernandez-Cuenca F, Pascual A, Vila J. Prevalence of IS(Aba1) in epidemiologically unrelated Acinetobacter baumannii clinical isolates. FEMS Microbiol Lett 2007;274:63-6. 57. Bou G, Martνnez-Beltrαn J. Cloning, nucleotide sequencing, and analysis of the gene encoding an AmpC beta-lactamase in Acinetobacter baumannii. Antimicrob Agents Chemother 2000;44:428-32. 58. Hιritier C, Poirel L, Nordmann P. Cephalosporinase over-expression resulting from insertion of ISAba1 in Acinetobacter baumannii. Clin Microbiol Infect 2006;12:123-30. 59. Corvec S, Caroff N, Espaze E, Giraudeau C, Drugeon H, Reynaud A. AmpC cephalosporinase hyperproduction in Acinetobacter baumannii clinical strains. J Antimicrob Chemother 2003;52:629-35. 60. Segal H, Nelson EC, Elisha BG. Genetic environment and transcription of ampC in an Acinetobacter baumannii clinical isolate. Antimicrob Agents Chemother 2004;48:612-4. 61. Bonomo RA, Szabo D. Mechanisms of multidrug resistance in Acinetobacter species and Pseudomonas aeruginosa. Clin Infect Dis 2006;43:49-56. 62. Hιritier C, Poirel L, Lambert T, Nordmann P. Contribution of acquired carbapenem-hydrolyzing oxacillinases to carbapenem resistance in Acinetobacter baumannii. Antimicrob Agents Chemother 2005;49:3198-202. 63. Afzal-Shah M, Woodford N, Livermore DM. Characterization of OXA-25, OXA-26, and OXA-27, molecular class D beta-lactamases associated with carbapenem resistance in clinical isolates of Acinetobacter baumannii. Antimicrob Agents Chemother 2001;45:583-8. 64. Brown S, Amyes S. OXA (beta)-lactamases in Acinetobacter: the story so far. J Antimicrob Chemother 2006;57:1-3. 65. Poirel L, Pitout JD, Nordmann P. Carbapenemases: molecular diversity and clinical consequences. Future Microbiol 2007;2:501-12. 66. Walther-Rasmussen J, Hψiby N. OXA-type carbapenemases. J Antimicrob Chemother 2006;57:373-83. 67. Poirel L, Nordmann P. Genetic structures at the origin of acquisition and expression of the carbapenem-hydrolyzing oxacillinase gene blaOXA-58 in Acinetobacter baumannii. Antimicrob Agents Chemother 2006;50:1442-8. 68. Coelho JM, Turton JF, Kaufmann ME, Glover J, Woodford N, Warner M, et al. Occurrence of carbapenem-resistant Acinetobacter baumannii clones at multiple hospitals in London and Southeast England. J Clin Microbiol 2006;44:3623-7. 69. Suαrez CJ, Lolans K, Villegas MV, Quinn JP. Mechanisms of resistance to beta-lactams in some common Gram-negative bacteria causing nosocomial infections.th Expert Rev Anti Infect Ther 2005;3:915-22. 70. Hιritier C, Poirel L, Fournier PE, Claverie JM, Raoult D, Nordmann P. Characterization of the naturally occurring oxacillinase of Acinetobacter baumannii. Antimicrob Agents Chemother 2005;49:4174-9. 71. Livermore DM, Woodford N. The beta-lactamase threat in Enterobacteriaceae, Pseudomonas and Acinetobacter. Trends Microbiol 2006;14:413-20. 72. Walsh TR, Toleman MA, Poirel L, Nordmann P. Metallo-beta-lactamases: the quiet before the storm? Clin Microbiol Rev 2005;18:306-25. 73. Vahaboglu H, Oztόrk R, Aygόn G, CoΊkunkan F, Yaman A, Kaygusuz A, et al . Widespread detection of PER-1-type extended-spectrum beta-lactamases among nosocomial Acinetobacter and Pseudomonas aeruginosa isolates in Turkey: a nationwide multicenter study. Widespread detection of PER-1-type extended-spectrum beta-lactamases among nosocomial Acinetobacter and Pseudomonas aeruginosa isolates in Turkey: a nationwide multicenter study. 1997;41:2265-9. 74. Poirel L, Cabanne L, Vahaboglu H, Nordmann P. Genetic environment and expression of the extended-spectrum beta-lactamase blaPER-1 gene in gram-negative bacteria. Antimicrob Agents Chemother 2005;49:1708-13. 75. Poirel L, Menuteau O, Agoli N, Cattoen C, Nordmann P. Outbreak of extended-spectrum beta-lactamase VEB-1-producing isolates of Acinetobacter baumannii in a French hospital. J Clin Microbiol 2003;41:3542-7. 76. Girlich D, Naas T, Leelaporn A, Poirel L, Fennewald M, Nordmann P. Nosocomial spread of the integron-located veb-1-like cassette encoding an extended-pectrum beta-lactamase in Pseudomonas aeruginosa in Thailand. Clin Infect Dis 2002;34:603-11. 77. Queenan AM, Bush K. Carbapenemases: the versatile beta-lactamases. Clin Microbiol Rev. 2007;20:440-58. 78. Seward RJ, Lambert T, Towner KJ. Molecular epidemiology of aminoglycoside resistance in Acinetobacter spp. J Med Microbiol 1998;47:455-62. 79. Nemec A, Dolzani L, Brisse S, van den Broek P, Dijkshoorn L. Diversity of aminoglycoside-resistance genes and their association with class 1 integrons among strains of pan-European Acinetobacter baumannii clones. J Med Microbiol 2004;53:1233-40. 80. Li J, Nation RL, Milne RW, Turnidge JD, Coulthard K. Evaluation of colistin as an agent against multi-resistant Gram-negative bacteria. Int J Antimicrob Agents 2005;25:11-25. 81. Giamarellou H, Antoniadou A, Kanellakopoulou K. Acinetobacter baumannii: a universal threat to public health? Int J Antimicrob Agents 2008;32:106-19. 82. Vila J, Ruiz J, Goρi P, Marcos A, Jimenez de Anta T. Mutation in the gyrA gene of quinolone-resistant clinical isolates of Acinetobacter baumannii. Antimicrob Agents Chemother 1995;39:1201-3. 83. Vila J, Ruiz J, Goρi P, Jimenez de Anta T. Quinolone-resistance mutations in the topoisomerase IV parC gene of Acinetobacter baumannii. J Antimicrob Chemother 1997;39:757-62. 84. Hanberger H, Garcia-Rodriguez JA, Gobernado M, Goossens H, Nilsson LE, Struelens MJ. Antibiotic susceptibility among aerobic gram-negative bacilli in intensive care units in 5 European countries. French and Portuguese ICU Study Groups. JAMA 1999;281:67-71. 85. Turner PJ, Greenhalgh JM; MYSTIC Study Group (Europe). The activity of meropenem and comparators against Acinetobacter strains isolated from European hospitals, 1997-2000. Clin Microbiol Infect 2003;9:563-7. 86. Turner PJ. Meropenem activity against European isolates: report on the MYSTIC (Meropenem Yearly Susceptibility Test Information Collection) 2006 results. Diagn Microbiol Infect Dis 2008;60:185-92. 87. Perez F, Hujer AM, Hujer KM, Decker BK, Rather PN, Bonomo RA. Global challenge of multidrug-resistant Acinetobacter baumannii. Antimicrob Agents Chemother 2007;51:3471-84. 88. Gales AC, Jones RN, Sader HS. Global assessment of the antimicrobial activity of polymyxin B against 54 731 clinical isolates of Gram-negative bacilli: report from the SENTRY antimicrobial surveillance programme (2001-2004). Clin Microbiol Infect 2006;12:315-21. 90. Sinha M, Srinivasa H, Macaden R. Antibiotic resistance profile & extended spectrum beta-lactamase (ESBL) production in Acinetobacter species. Indian J Med Res 2007;126:63-7. 91. Trottier V, Segura PG, Namias N, King D, Pizano LR, Schulman CI. Outcomes of Acinetobacter baumannii infection in critically ill burned patients. J Burn Care Res 2007;28:248-53. 92. Souli M, Kontopidou FV, Koratzanis E, Antoniadou A, Giannitsioti E, Evangelopoulou P, et al. In vitro activity of tigecycline against multiple-drug-resistant, including pan-resistant, gram-negative and gram-positive clinical isolates from Greek hospitals. Antimicrob Agents Chemother 2006;50:3166-9. 93. Falagas ME, Rafailidis PI, Matthaiou DK, Virtzili S, Nikita D, Michalopoulos A. Pandrug-resistant Klebsiella pneumoniae, Pseudomonas aeruginosa and Acinetobacter baumannii infections: characteristics and outcome in a series of 28 patients. Int J Antimicrob Agents 2008;32:450-4. 94. Henwood CJ, Gatward T, Warner M, James D, Stockdale MW, Spence RP, et al. Antibiotic resistance among clinical isolates of Acinetobacter in the UK, and in vitro evaluation of tigecycline (GAR-936). J Antimicrob Chemother 2002;49:479-87. 95. Beno P, Krcmery V, Demitrovicova A. Bacteraemia in cancer patients caused by colistin-resistant Gram-negative bacilli after previous exposure to ciprofloxacin and/or colistin. Clin Microbiol Infect 2006;12:496-500. 96. Rodloff AC, Leclercq R, Debbia EA, Cantσn R, Oppenheim BA, Dowzicky MJ. Comparative analysis of antimicrobial susceptibility among organisms from France, Germany, Italy, Spain and the UK as part of the tigecycline evaluation and surveillance trial. Clin Microbiol Infect 2008;14:307-14. 97. Seifert H, Stefanik D, Wisplinghoff H. Comparative in vitro activities of tigecycline and 11 other antimicrobial agents against 215 epidemiologically defined multidrug-resistant Acinetobacter baumannii isolates. J Antimicrob Chemother 2006;58:1099-100. 98. Dizbay M, Altuncekic A, Sezer BE, Ozdemir K, Arman D. Colistin and tigecycline susceptibility among multidrug-resistant Acinetobacter baumannii isolated from ventilator-associated pneumonia. Int J Antimicrob Agents 2008;32:29-32. 99. Chastre J, Trouillet JL, Vuagnat A, Joly-Guillou ML. Nosocomial infections caused by Acinetobacter spp. Microbiology, Epidemiology, Infections, Management. Danvers: CRC press 1996:117-132. 100. Biedenbach DJ, Moet GJ, Jones RN. Occurrence and antimicrobial resistance pattern comparisons among bloodstream infection isolates from the SENTRY Antimicrobial Surveillance Program (1997-2002). Diagn Microbiol Infect Dis 2004;50:59-69. 101. Fagon JY, Chastre J, Hance AJ, Montravers P, Novara A, Gibert C. Nosocomial pneumonia in ventilated patients: a cohort study evaluating attributable mortality and hospital stay. Am J Med 1993;94:281-8. 102. Falagas ME, Bliziotis IA, Siempos II. Attributable mortality of Acinetobacter baumannii infections in critically ill patients: a systematic review of matched cohort and case-control studies. Crit Care 2006;10:48. 103. Marques MB, Brookings ES, Moser SA, Sonke PB, Waites KB. Comparative in vitro antimicrobial susceptibilities of nosocomial isolates of Acinetobacter baumannii and synergistic activities of nine antimicrobial combinations. Antimicrob Agents Chemother 1997;41:881-5. 104. Doi Y, Husain S, Potoski BA, McCurry KR, Paterson DL. Extensively drug-resistant Acinetobacter baumannii. Emerg Infect Dis 2009;15:980-1. 105. Brauers J, Frank U, Kresken M, Rodloff AC, Seifert H. Activities of various beta-lactams and beta-lactam/beta-lactamase inhibitor combinations against Acinetobacter baumannii and Acinetobacter DNA group 3 strains. Clin Microbiol Infect 2005;11:24-30. 106. Higgins PG, Wisplinghoff H, Stefanik D, Seifert H. In vitro activities of the beta-lactamase inhibitors clavulanic acid, sulbactam, and tazobactam alone or in combination with beta-lactams against epidemiologically characterized multidrug-resistant Acinetobacter baumannii strains. Antimicrob Agents Chemother 2004;48:1586-92. 107. Wood GC, Hanes SD, Croce MA, Fabian TC, Boucher BA. Comparison of ampicillin-sulbactam and imipenem-cilastatin for the treatment of Acinetobacter ventilator-associated pneumonia. Clin Infect Dis 2002;34:1425-30. 108. Levin AS, Levy CE, Manrique AE, Medeiros EA, Costa SF. Severe nosocomial infections with imipenem-resistant Acinetobacter baumannii treated with ampicillin/sulbactam. Int J Antimicrob Agents 2003;21:58-62. 109. Giske CG, Monnet DL, Cars O, Carmeli Y; ReAct-Action on Antibiotic Resistance. Clinical and economic impact of common multidrug-resistant gram-negative bacilli. Antimicrob Agents Chemother 2008;52:813-21. 110. Principe L, D'Arezzo S, Capone A, Petrosillo N, Visca P. In vitro activity of tigecycline in combination with various antimicrobials against multidrug resistant Acinetobacter baumannii. Ann Clin Microbiol Antimicrob 2009;21:8-18. 111. Li J, Nation RL, Turnidge JD, Milne RW, Coulthard K, Rayner CR, et al. Colistin: the re-emerging antibiotic for multidrug-resistant Gram-negative bacterial infections. Lancet Infect Dis 2006;6:589-601. 112. Petrosillo N, Chinello P, Proietti MF, Cecchini L, Masala M, Franchi C, et al. Combined colistin and rifampicin therapy for carbapenem-resistant Acinetobacter baumannii infections: clinical outcome and adverse events. Clin Microbiol Infect 2005;11:682-3. 113. Levin AS, Barone AA, Penηo J, Santos MV, Marinho IS, Arruda EA, et al. Intravenous colistin as therapy for nosocomial infections caused by multidrug-resistant Pseudomonas aeruginosa and Acinetobacter baumannii. Clin Infect Dis 1999;28:1008-11. 114. Katragkou A, Roilides E. Successful treatment of multidrug-resistant Acinetobacter baumannii central nervous system infections with colistin. J Clin Microbiols 2005;43:4916-7. 115. Fulnecky EJ, Wright D, Scheld WM, Kanawati L, Shoham S. Amikacin and colistin for treatment of Acinetobacter baumannii meningitis. J Infect 2005;51:249-51. 116. Kim BN, Peleg AY, Lodise TP, Lipman J, Li J, Nation R, Paterson DL. Management of meningitis due to antibiotic-resistant Acinetobacter species. none Lancet Infect Dis 2009;9:245-55. 117. Falagas ME, Bliziotis IA, Tam VH. Intraventricular or intrathecal use of polymyxins in patients with Gram-negative meningitis: a systematic review of the available evidence. IInt J Antimicrob Agents 2007;29:9-25. 118. Li J, Rayner CR, Nation RL, Owen RJ, Spelman D, Tan KE, et al. Heteroresistance to colistin in multidrug-resistant Acinetobacter baumannii. Antimicrob Agents Chemother 2006;50:2946-50. 119. Owen RJ, Li J, Nation RL, Spelman D. In vitro pharmacodynamics of colistin against Acinetobacter baumannii clinical isolates. J Antimicrob Chemother 2007;59:473-7. 120. Hernan RC, Karina B, Gabriela G, Marcela N, Carlos V, Angela F. Selection of colistin-resistant Acinetobacter baumannii isolates in postneurosurgical meningitis in an intensive care unit with high presence of heteroresistance to colistin. Diagn Microbiol Infect Dis 2009;65:188-91. 121. Montero A, Ariza J, Corbella X, Domιnech A, Cabellos C, Ayats J, et al. Antibiotic combinations for serious infections caused by carbapenem-resistant Acinetobacter baumannii in a mouse pneumonia model. J Antimicrob Chemother 2004;54:1085-91. 122. Saballs M, Pujol M, Tubau F, Peρa C, Montero A, Domνnguez MA, et al. Rifampicin/imipenem combination in the treatment of carbapenem-resistant Acinetobacter baumannii infections. J Antimicrob Chemother 2006;58:697-700. 123. Bernabeu-Wittel M, Pichardo C, Garcνa-Curiel A, Pachσn-Ibαρez ME, Ibαρez-Martνnez J, Jimιnez-Mejνas ME, et al. Pharmacokinetic/pharmacodynamic assessment of the in-vivo efficacy of imipenem alone or in combination with amikacin for the treatment of experimental multiresistant Acinetobacter baumannii pneumonia. Clin Microbiol Infect 2005;11:319-25. 124. Falagas ME, Sideri G, Vouloumanou EK, Papadatos JH, Kafetzis DA. Intravenous colistimethate (colistin) use in critically ill children without cystic fibrosis. Pediatr Infect Dis J 2009;28:123-7. 125. Goverman J, Weber JM, Keaney TJ, Sheridan RL. Intravenous colistin for the treatment of multidrug resistant, gram-negative infection in the pediatric burn population. J Burn Care Res 2007;28:421-6. 126. Fierobe L, Lucet JC, Decrι D, Muller-Serieys C, Deleuze A, Joly-Guillou ML, et al. An outbreak of imipenem-resistant Acinetobacter baumannii in critically ill surgical patients. Infect Control Hosp Epidemiol 2001;22:35-40. 4 The activity of silver nanoparticles (Axonnite) on clinical and environmental strains of Acinetobacter spp. 15 Use of high-dose IV and aerosolized colistin for the treatment of multidrug-resistant Acinetobacter baumannii ventilator-associated pneumonia: do we really need this treatment? 16 Clinical Experience of Tigecycline Treatment in Infections Caused by Extensively Drug-ResistantAcinetobacterspp. 17 Acinetobacter baumannii. ¿Un oportunista fuera de lugar?